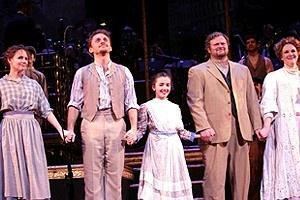 A Tree Grows in Brooklyn - City Center Encores! The show, due to a book that would seem antiquated and melodramatic by today's standards, is unlikely to ever receive a Broadway revival (although it did receive a revival last year at Goodspeed Opera House). However, the show possesses a golden score characteristic of the Broadway golden age of the early 1950s, and is worth breathing life into, even if just for a weekend at City Center. “A Tree Grows in Brooklyn,” the 1951 Broadway musical (music by Arthur Schwartz, lyrics by Dorothy Fields, book by George Abbott and Betty Smith) based on the novel by Betty Smith, represents the perfect show for a company like City Center Encores! to present. The show, due to a book that would seem antiquated and melodramatic by today’s standards, is unlikely to ever receive a Broadway revival (although it did receive a revival last year at Goodspeed Opera House). However, the show possesses a golden score characteristic of the Broadway golden age of the early 1950s, and is worth breathing life into, even if just for a weekend at City Center. Gary Griffin, who has tamed previous Encores! productions including “The New Moon” and last year’s “Pardon My English,” provides skillful, erudite direction for the piece, showcasing the musical’s memorable score as well as a number of talented performers such as Jason Danieley, Emily Sinner, and Sally Murphy. The show then follows the marital saga of Johnny and Katie’s relationship. Johnny, it is revealed, is a constant drunkard, and this prevents him from being able to hold down a good job. It even forces his wife to take a job as their building’s janitor. At the end of Act One, we see her scrubbing the stage with a sponge and bucket. However, it is at these moments of pain that Johnny comforts her with his idealistic, childlike dreams and visions. In “I’ll Buy You A Star,” Johnny swears to his wife that “I’ll buy you a star, Not just a star, But the best one in the Sky…But I won’t rest, Until I Buy the moon.” Yes, these lyrics seem awful weighty, but set to sweeping musical refrains by Arthur Schwartz, it presented a beautiful moment onstage when, at the end of the song, an embittered yet in love Katie ran back into Johnny’s arms, and the curtain fell. And in the midst of the Johnny-Katie soap opera is a separate second lead-musical comedy plot involving Aunt Cissy and her beau Harry (John Ellison Conlee). In the original Broadway production, the role of Cissy was played by the comic actress Shirley Booth, and she became the well-regarded person in the production by critics and audiences. Emily Skinner, an Encores! veteran, was delightful and spunky in the role. Skinner was recently on the road in the Disney touring company of “On the Record,” and on certainly looks forward to her eventual return to Broadway. A young actress also worth nothing is thirteen year old Katherine Faye Barry, who played Johnny and Katie’s young daughter, Francie. She was onstage throughout the second act, and her acting stood par with the rest of the adult company. One must also mention the detailed period appropriate costumes of Carrie Robbins. As many learned at the show’s Saturday matinee post performance discussion, the costumes used in the production were created mainly out of garments that were nearly 100 years old! Encores! next production, which takes place next month, will be the 1970’s musical “Purlie.” For more information, visit Citycenter.org. Clever is the word to describe Matthew Bourne’s ballet version of a ballet film classic. A nostalgic and entertaining evening of standards that suggests a promising 16th season from the creator of this long-running event series.